Carlsen finished with three wins in a row. | Photo: Shamkir Chess. Having already secured victory yesterday, Magnus Carlsen finished the Gashimov Memorial in style. On Tuesday he defeated Alexander Grischuk to finish two points ahead of the pack, something the chess world hadn't seen for 4.5 years. After drawing his own game very quickly, Anish Giri said: "It looks like today the only one who will really fight is the one who doesn't have to fight anymore, that Magnus will be the only one who will really go for it." Carlsen did go for it, and his fighting spirit was rewarded with a third win in a row. He finished on 7/9, the most dominating victory since Fabiano Caruana's win at the 2014 Sinquefield Cup. 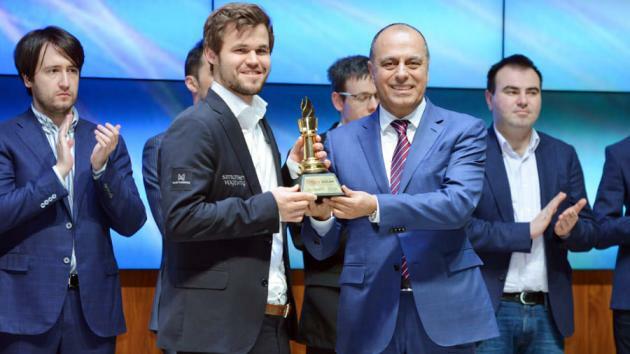 At the closing ceremony, Carlsen called it one of the best tournaments he had ever played "both in terms of performance and also of quality of the games." Today's tournament achievement, 12 points shy of a 3000 performance rating, evoked superlative reactions from some of Carlsen's colleagues in Shamkir. Teimour Radjabov: "A stellar performance, really unique. Carlsen at his best." Grischuk: "I think Magnus played just amazingly well today." Grischuk was impressed by his opponent's play. | Photo: Shamkir Chess. As always, Tarjei Svensen of Norway was quick to provide some statistics. For instance, Carlsen's performance in 2019 is 2927 (+10 =12 -0) and he has been undefeated for 50 games in a row. Carlsen's new virtual Elo rating is 2861, which is just 21 points below his career-best rating of 2882 from May 2014. The last time his rating was this high was in June 2015, when his Elo was 2876. He is now 44 points ahead of number-two Caruana. The difference between Carlsen and the rest of the world that hasn't been this high since September 2016 (when Maxime Vachier-Lagrave was world number-two, also 44 points behind). The live ratings after today's round. | Source: 2700Chess. Carlsen vs Grischuk started as an Anti-Berlin where the players left theory on move eight. After some normal moves, the Norwegian GM decided to go for a symmetrical center and trade queens, where his advanced a-pawn was giving a hint of some pressure. Grischuk must have felt completely outplayed when he remarked, slightly exaggerating: "I think I made just one very bad move, 16...b5." White won the bishop pair after 17.Nb3 Bxb3 18.Bxb3. "I suspected it's bad," Grischuk said about the position after 34 moves. "There are pins, counter-pins, some mating net; sometimes it's good for Black, sometimes good for White..."
Carlsen smiling at Grischuk at the press conference. | Photo: Shamkir Chess. Grischuk: "I thought I was in trouble here but 35.Rd2 was a complete surprise for me." Carlsen noted that all the tactics are in White's favor at the end. "Everything works." Carlsen is the first to win a super tournament with a margin bigger than 1.5 points since Caruana dominated the 2014 Sinquefield Cup. | Photo: Shamkir Chess. Radjabov called it "an extremely stupid decision in general" to play the Caro-Kann against David Navara, who is a Caro-Kann player himself. However, the desire to surprise his opponent was there, and he had already prepared the opening for his game with Grischuk. The Azerbaijani grandmaster was disgusted about his position after 20 moves, and said: "I was only optimistic because I made eight draws before this round." As his opponent couldn't find the most critical moves, Radjabov also drew his last game. Last year he also played nine draws in Shamkir. He remains ultra solid, winning 3.2 rating points here. World number-12 is still not a bad place to be for a relatively inactive player like him! Once again nine draws for Radjabov. | Photo: Shamkir Chess. Navara, who scored 1.5 points more than last year: "I am happy to have played many interesting games. Usually I play much worse in super-tournaments." The always modest grandmaster even said he "did not deserve to play here" and suggested Vladimir Artemiev in his place, but Radjabov corrected him and called Navara-Ding Liren "a gem" and "a really great game." Vishy Anand and Veselin Topalov, in 2010 the participants of a world-championship match, played each other for the 72nd time in a classical game. The mutual score of 19 vs 13 wins for Anand remained the same, after they played their 40th draw today. Anand seemed to have a slight plus in a Giuoco Pianissimo, and everything depended on the central pawn break 15...d5. "Either it works or it doesn't," said Topalov. "In the game it looked like I could equalize." Anand-Topalov brought back memories from nine years ago. | Photo: Shamkir Chess. The other two games were not very serious; in such strong super-tournaments it's quite common to see a few quick draws among players who either don't have anything to play for or are simply out of shape, and want it to be over. In a bit less than an hour, Shakhriyar Mamedyarov and Sergey Karjakin were done; they played one of those topical Queen's Gambits we also saw in e.g. the Caruana-Carlsen match. Karjakin: "Basically I prepared this line a lot with White so I tried to play it as Black." The players followed Carlsen-Anand from this tournament; Karjakin deviated with the precise move 17...Rb8 and soon the players started repeating. Improving upon Anand's play, Karjakin drew easily. | Photo: Shamkir Chess. "It was a very interesting tournament as usual, but it was spoiled by yesterday's game. I forgot my lines. (...) I forgot to play one important move." He also revealed that the preparation with his second Denis Khismatullin had focused on 1...e5 (since Carlsen only needed a draw), and that the variation 8...Ne7 had come as a slight surprise as well. "But I will say that at least I tried, I was fighting," said Karjakin. "I will share second place and I cannot call it a bad result but when you're on plus-two you already hope for more." Ding Liren and Anish Giri spent even less time at the board: about 17 minutes. It was a theoretically very drawish line which e.g. Vassily Ivanchuk used to draw with Carlsen in 2015 in Wijk aan Zee. Carlsen, who had just won six games in a row and wanted to try to at least equal Caruana's seven-game winning streak from the 2014 Sinquefield Cup, stated after the game: "This is not chess, this is just nonsense." "We were both well enough prepared to know that we were able to make a draw like this. We had not agreed beforehand; I have never agreed beforehand in my life with anyone, but if I see this variation and my opponent playing it, I know what he wants, and I'm Black...Like I told him after the game, he wanted to fix my last place. So today is not yet the day of my comeback!" No comeback yet for Giri, who finished in last place with 3 points. | Photo: Shamkir Chess. Ding said he had little energy after yesterday's long game, and that since he couldn't fight for first place anymore, it didn't make much sense to play for a win. Giri: "If you win rook against knight then you don't have to win every game. It's OK!" Ding Liren said he was running out of energy. | Photo: Shamkir Chess. The Gashimov Memorial had a prize fund of 100,000 euros ($112,266) with a first prize of 30,000 euros ($33,678). The venue was the Heydar Aliyev Centre in Shamkir, Azerbaijan. The playing days were March 31-April 9 with a rest day on April 5. The time control was two hours for the first 40 moves, then one hour for the next 20 moves and then 15 minutes to finish the game with a 30-second increment from move 61 onwards. No draw agreements by the players were allowed before move 41.